AFC Rushden & Diamonds made sure their excellent season brought reward last night as they secured promotion from Evo-Stik South League East. 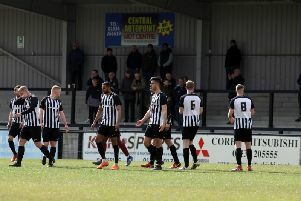 A superb 7-1 win over Aylesbury FC at Hayden Road ensured a third promotion in six years and meant the celebrations could start for boss Andy Peaks and his men. Here are some of the pictures our photographer Alison Bagley captured of a great evening for Diamonds.